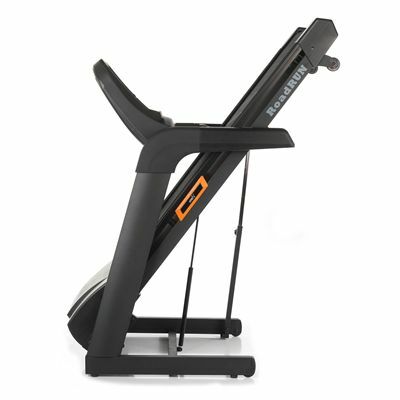 Driven by a 2.8hp continuous duty, high-grade, motor and boasting an impressive 15 incline levels, the DKN Roadrunner I treadmill delivers a truly great running experience. 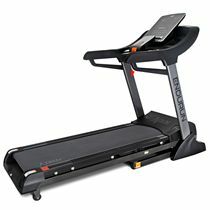 Independently reviewed as one of the quietest and smoothest home treadmills on the market, its powerhouse of a motor drives the thick, spacious 53cm (21’’) x 143cm (56’’) belt up to a maximum speed of 20kph (12.4mph) effortlessly. The 3.3mm orthopaedic belt combines with the progressive shock absorption system to provide a wonderfully cushioned and responsive running surface that efficiently reduces the impact shock of landing while still providing a firm surface to take off from. With 15 levels of challenging incline and a whopping 24 preset programmes the Roadrunner I will keep even the most experienced runners challenged. In addition to the preset programmes, there are also 2 user defined programmes allowing you to create your own workouts, a heart rate control function (for use with wireless chest belt, sold separately) and quick-start manual workout providing you with plenty of different training options. 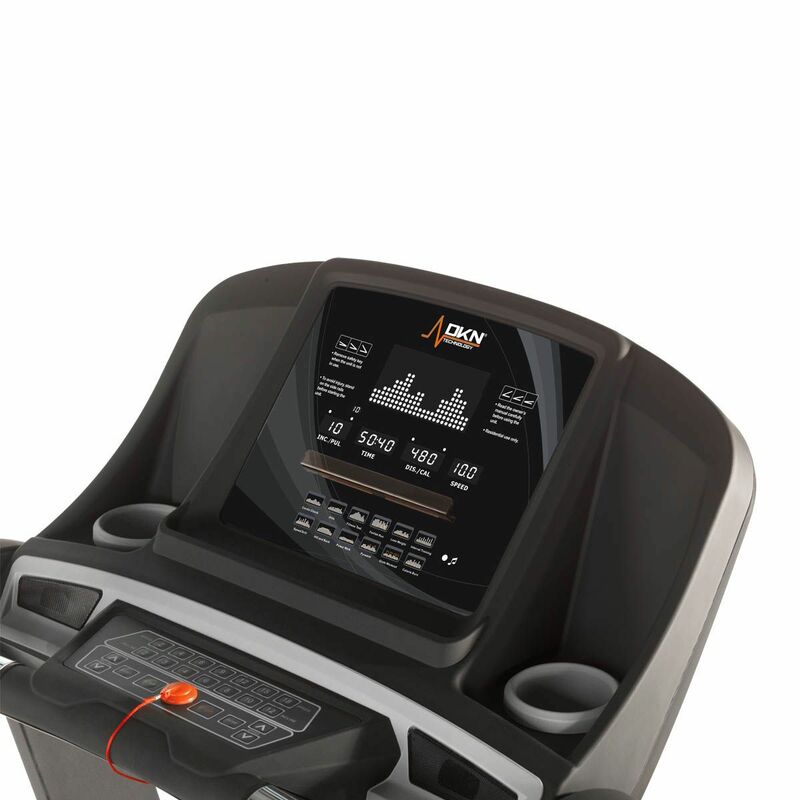 The large LED display clearly presents easy-to-read live training feedback including speed, incline, pulse, distance and theoretical calorie burn allowing you to easily track your training data and monitor your performance and progress. The console features a tablet holder so you can watch your favourite movies, tv shows or music videos while working out and a 3.5mm audio jack is also available so you can connect your device and playback via the built-in speakers. Strikingly, the console also has an integrated Bluetooth chip allowing you to connect your tablet or smartphone making the Roadrunner I compatible with Kinomap app, offering multiple interactive training options. 2 user profiles allow you to enter and save personalised metrics (age/gender/weight/height) in order to provide greater accuracy of key workout data and an assisted lift/soft drop folding mechanism makes folding and unfolding this beast of a treadmill an absolute piece of cake. 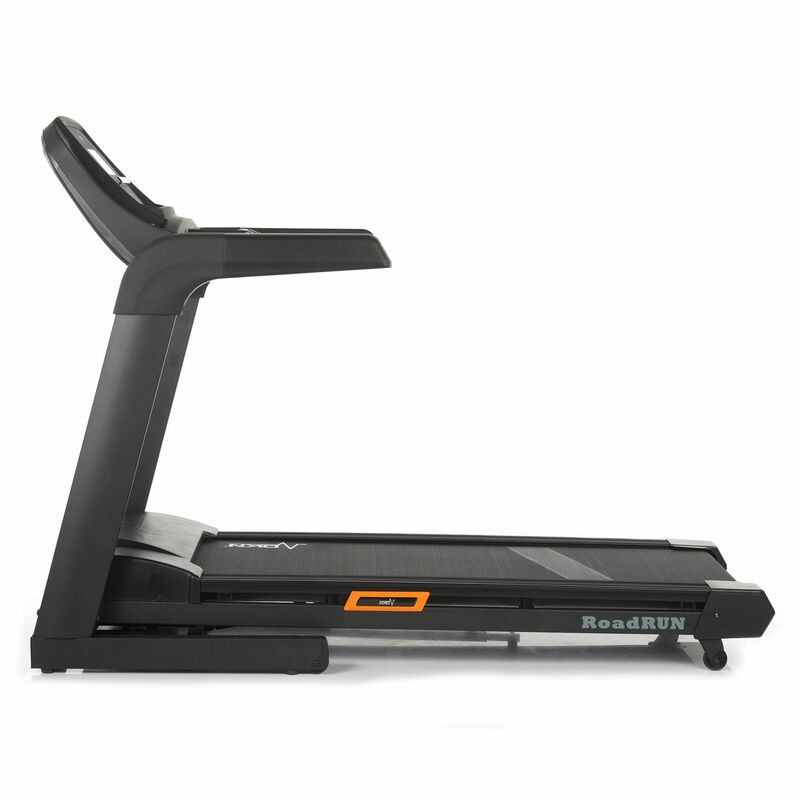 Built to withstand the trials of life in a family home this outstanding treadmill is ideally suited for use by the whole family and advanced runners alike. 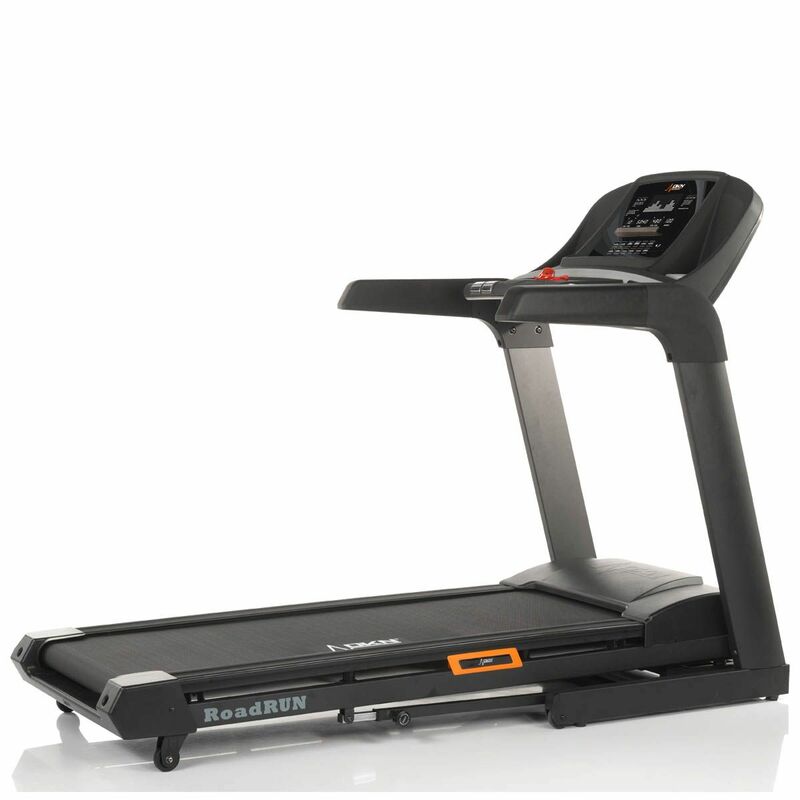 for submitting product information about DKN RoadRunner I Treadmill We aim to answer all questions within 2-3 days. 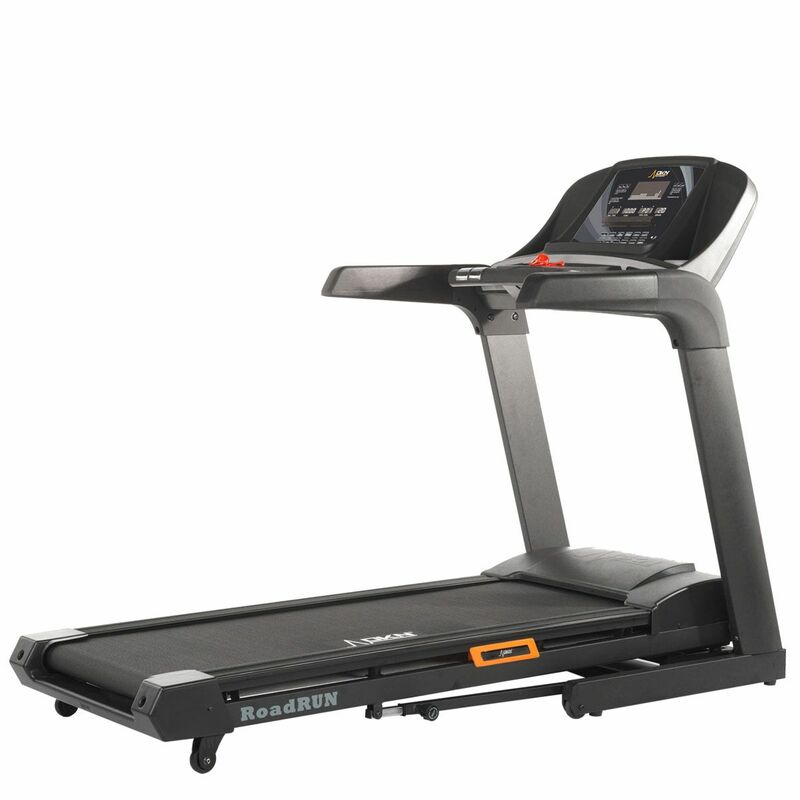 for submitting product information about DKN RoadRunner I Treadmill. We aim to answer all questions within 2-3 days. If you provided your name and email address, we will email you as soon as the answer is published. Yes. With its generous dimensions and substantial bulk, the RoadRunner I is well suited for even the tallest of runners. How high is the running surface off the ground? I have a low ceiling which will impact whether this treadmill is suitable. Hi. It is 16.5cm (6.5") off the ground. 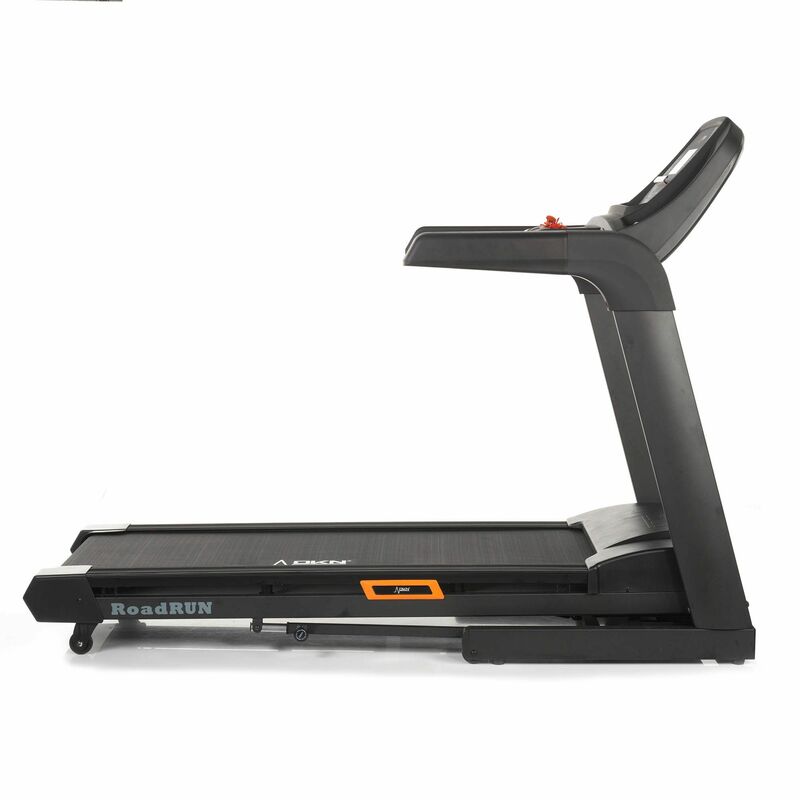 Hello I am interested in both the Road runner and EZ run treadmills. Can you confirm the folded dimensions are smaller on the length for the Roadrunner compared to the EZ Run (76cm vs 116cm) Is this correct? Yes, that is absolutely correct. When folded, the RoadRunner's dimensions are: Length=76cm (30’’), Width=90cm (35.5’’), Height=164cm (64.5’’), whereas folded dimensions of the EzRun are as follows: Length=116cm (45.6”), Width=85cm (33.5”), Height=159cm (62.6”). What is the dimensions of this for delivery? It comes in a single box with dimensions: 225 x 99 x 44 cm. Can I keep this treadmill in my garage? What heart rate monitors are compatible with this model? Is there a drinks holder? 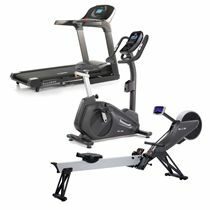 Can I put this treadmill in a first floor room? Under normal circumstances it's suitable for non-ground floor locations. Though it's worth checking the dimensions to make sure it will fit where you need it to go. Otherwise the weight should not be a problem. Does it have a safety system? Hi Yes. The Roadrunner comes with a safety key. 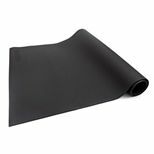 Should you stumble or fall, the cord will pull the safety off it's magnetic pad causing the treadmill to cut power immediately. Is there somehwere to place you tablet while running? Is the display in miles per hour? The Roadrunner can display both using the DKN Apps. You can change from imperial to metric in the app. The console itself is set to KM and cannot be changed. Yes. 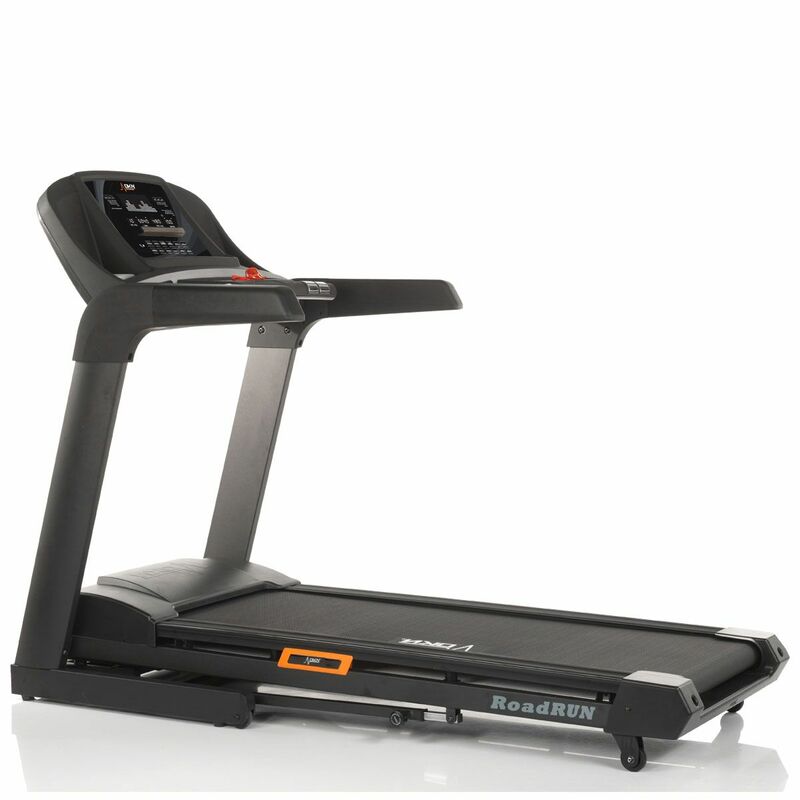 Installation is available with this treadmill to most postcodes in England and Wales. Just let us know you require installation when placing your order by using the special instructions and our installations team will contact you to get everything arranged. How does the iPhone work what do you have to do? The Mobile app works in exactly the same way as the tablet apps, please follow the connectivity instructions listed in the user manual. Good quality treadmill, easy to use. No problems encountered. I use my treadmill every day and I love it. Absolutely the nearest thing you’ll get to gym spec in your own home. My only word of warning is that you must decide where it’s going to live before you build it. It’s not going anywhere it’s so heavy! I don’t even know how you’d get it upstairs. However I am so pleased with it and would highly recommend it. We've been home treadmill users for more than a decade. Like our previous machine, this one will be used on a near daily basis (especially during the winter months). So far the machine has stood up well. Feels robust, yet quiet - and is comfortable enough to use. The Bluetooth connection is a nice idea, but DKN's tablet app could be improved (treadmill is unfortunately not compatible with RunSocial - which is vastly better). But all in all, we're very pleased with our purchase. So far been good - very solid. Would benefit from having speed & incline controls on the arms as well. Good gym quality treadmill. Easy to assemble, although heavy to move around! As per a previous review, the only thing missing is a pause button. Recommended. Everything was well packed and delivered. The display panel was not completely stuck donwyns and the console has minor plastic defects. Great machine. Big and sturdy. Speakers sound ok, not the best but ok. Only downside i found is it doesn't have a 'cool down' button, apart from that really pleased with it. Very pleased with my purchase. It took three men to deliver it. They were so pleased it was to go in the garage and not required to be carried upstairs. It was fiddly to put together. Although a little noisy on incline 1 setting, I love how it can be connected and synced with my ipad, so I can run anywhere I choose from the comfort of my garage and listen to my favourite tunes. Well made and sturdy treadmill. 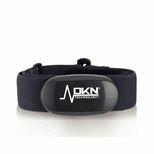 Would be 5 stars but the heart rate monitor hand grips are poor - very slow to respond - and the chest strap heart rate isn't bluetooth so you have to buy a dkn one. Also when changing a setting such as speed the heart rate reading reset to zero and then slowly gets back to where it was - this is just poor software on dkn's part. Other than these very minor points I'd happily buy again. Very pleased with the RoadRunner, I feel that having the treadmill at home makes me run more often than getting changed and going to the gym. Would recommend the DKN RoadRunner 1. Fabulous Treadmill! I personally found the assembly straightforward. I have been using it for a few months and am very pleased with it. The machine is large and well cushioned. The iWorld app is great! I am confident of its longevity as it features a large powerful motor. The treadmill feels great to run on. 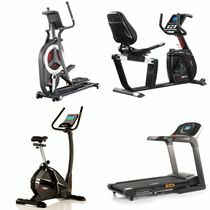 Decided to give up my gym membership as I didn't want to have to queue to use the equipment anymore. Glad I bought this treadmill and it has served me very well so far. I'd say I'm an intermediate runner and as such needed something with a large running deck so I could really push myself and a decent incline. This ticked all the boxes and for the price it really does rival some of the more expensive light commercial units. Fantastic value. for submitting product review about DKN RoadRunner I Treadmill.